Cfast is an innovative cosmetic orthodontic procedure that straightens the front teeth, producing aesthetic results in as few as 8 weeks at an affordable price for you. It is not a replacement for conventional orthodontic treatment, but is aimed at the "social 6," involving simple corrections that can be carried out easily by your accredited Cfast dentist. 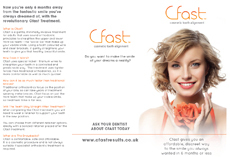 By using aesthetically pleasing clear brackets and tooth-coloured nickel-titanium wires placed on the front surface of the teeth, Cfast is readily accepted and proving hugely popular across the world. Copyright © Oak Dental Rochford. All rights reserved.